Screen printing is among the oldest and most versatile means of applying graphics to objects. 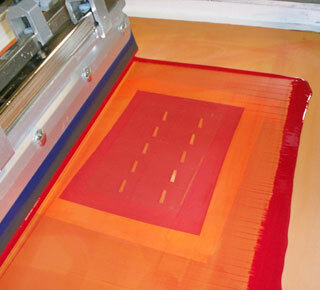 In screen printing, a stencil is created and laid over, or coated onto a fine screen mesh attached to a rigid frame. The media to be printed is placed onto the press and ink is poured onto the screen. A squeegee pulls the ink across screen, forcing it through the stencil thereby transferring the image to the media. This process is repeated for each required color, each using a different screen. Screen printing is ideal for printing medium to large runs of virtually any size part onto almost any flat media. Almost any color can be matched and the colors are rich, dense, and vibrant.